When R. Gregory Nokes began his research for The Troubled Life of Peter Burnett: Oregon Pioneer and First Governor of California — the first book-length biography of Peter Hardeman Burnett — he hoped to provide insight into the oftentimes illogical behavior of this influential, though not well remembered, historical figure. Peter Burnett’s resume is quite impressive: he helped organize the first wagon train to the Oregon Country, served on Oregon’s first elected government, was Oregon’s first supreme court judge, opened a wagon road from Oregon to California, helped develop the city of Sacramento, and was elected the first U.S. governor of California. But, with the exception of the wagon road to California, he did not excel in any of these roles. In order to provide Burnett’s perspective on his decision-making and failures, Nokes embarked on a lengthy journey to locate Burnett’s personal correspondence. He describes this journey below. There must be personal letters. Mustn’t there? I was working on my new book about Peter Hardeman Burnett — The Troubled Life of Peter Burnett: Oregon Pioneer and First Governor of California — whose behaviors in office frequently defied logic. I was hoping to find personal correspondence that might explain his state of mind at given points of his career. For example, didn’t he know he would subject himself to ridicule by changing the day of Thanksgiving in California from a Thursday to a Saturday to attend a dinner in his honor? To be sure, I had found letters, dozens of letters. Indeed, it seemed Burnett, who for a time led the first major wagon train to Oregon in 1843, couldn’t stop writing letters. Many of his letters were to newspapers on such issues as encouraging emigration to the West, promoting territorial status for Oregon, promoting statehood for California, and similar weighty topics. A one-time slaveholder, his advocacy of exclusion laws to ban blacks from the American West was well known. A letter he wrote to the New York Herald in 1845 on his experiences in Oregon ran to 125 pages and was printed in serialized form. Another to the Weekly Tribune in Liberty, Missouri, took up seven columns of newsprint. Burnett’s second address to the California Legislature as governor on January 7, 1851, filled twenty-seven pages of the Legislative Journal. There were hints of events and slights that shaped his later life in his 488-page autobiography, Recollections and Opinions of an Old Pioneer, completed in 1880. He told how as an adolescent he was sent by his parents, who were poor, to live with wealthy relatives in Tennessee, who, intentionally or not, made him feel inferior. Two girls he fancied wouldn’t give him the time of day, which he seemed to blame on his poverty and shabby clothing. As a result of these slights, perceived or otherwise, he resolved to become rich. That much I could glean from his autobiography. And while it served as a useful guidepost to Burnett’s life, it is for the most part self-laudatory in the extreme, glorifying his successes, while entirely ignoring his failures, of which there were many. But where was the private correspondence, letters to family and friends? After he shot and killed a black slave breaking into his store in Tennessee in 1830, did he share his feelings of remorse with anyone—he said he felt remorseful. Burnett was separated for six months from his wife, Harriet, when he left Oregon for the California gold fields in 1848. He must have written to her and their six children during their separation. One would think someone would have saved those letters. I visited the Bancroft Library in Berkeley, which had a file of Burnett’s correspondence as governor. But, not surprisingly, it was official correspondence — some of it quite interesting, such as Burnett calling out the militia in response to reports of attacks by native tribes on emigrants — but nothing personal. Indeed, a letter of supposed congratulations to a general for arranging peace talks with several Nisenan chieftains in El Dorado County was so stiffly written it might be read as insulting. Historical societies will often preserve troves of letters written by early leaders, but I found little for Burnett. While I still had plenty of material for my book, that important personal touch—such as Burnett’s thoughts on resigning as governor — would be missing. Resolved to go without, I had written two-thirds of the book when I finally got a lead. I stumbled on the internet — if one can stumble on the internet — across a 2014 copy of “Trailblazer,” a publication of the California Pioneers of Santa Clara County, featuring a photo of Burnett’s desk. 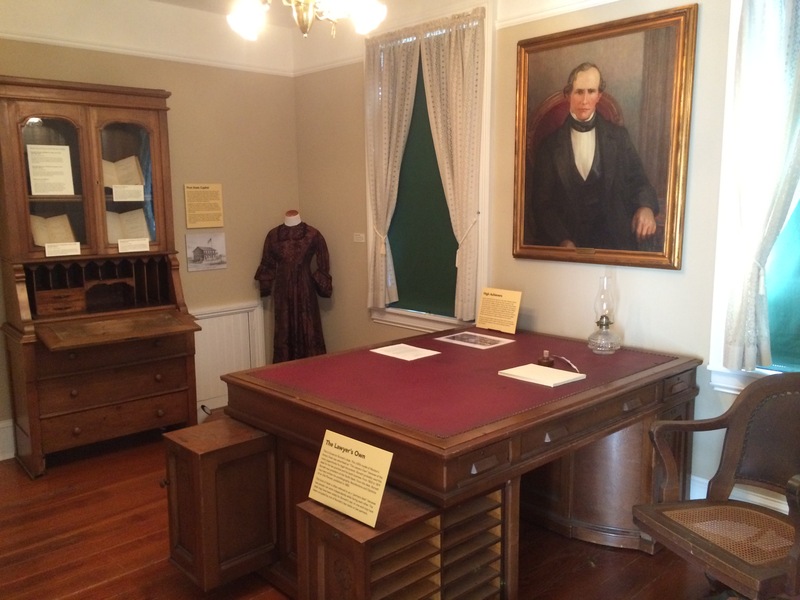 The accompanying article said the desk was on loan from a Burnett descendant, Francisca Burnett Allen of Los Gatos, to the Roberto Adobe and Sunol House Museum in San Jose. Burnett had lived in San Jose while governor. The author of the article, Judge Paul Bernal, put me in touch with Ms. Allen, who herself didn’t have any letters, but knew of another descendant, Emily Douville of Antioch, California, who had some letters. Ms. Douville proved to be more than helpful. She had twenty or so letters left by her late mother, who had always intended to write a book about Burnett, but never did. Ms. Douville texted copies to me in Oregon. Most were written by Burnett to a brother, George, in Lafayette, Oregon. I finally had what I needed to apply a human touch to Burnett’s character. Among revelations were his growing discouragement as governor and longing to return to civilian life: “The work for me is tiring and it is hard for me to keep along,” he wrote George on September 2, 1850. “My mind is too much occupied. I shall be glad when my time is out. I hope I shall never be in such another predicament.’’ He resigned four months later on January 9, 1851. Other letters revealed his sadness at the death of two of his children, of his wife’s trip to China, a complaint about another brother who hadn’t repaid a debt, and illnesses affecting both himself and Harriet, which he wrongly thought would bring his premature death. Of course, Burnett almost certainly wrote more letters to more people, including Harriet. Maybe those letters gather dust in an attic or closet somewhere, and will turn up someday. But it’s also quite possible they were destroyed, lost or discarded. Mine is the first book ever written about Burnett, whose promising early career was doomed by his own faults, among them his prejudices. But it doesn’t mean there won’t be another. One of the exciting things about being an author of nonfiction history is drawing on the work of previous writers and knowing that others will come along and build on your work. So perhaps some future writer will locate other letters with material for another book on Burnett. But my work is done. Copyright 2019 R. Greagory Nokes. All Rights Reserved.